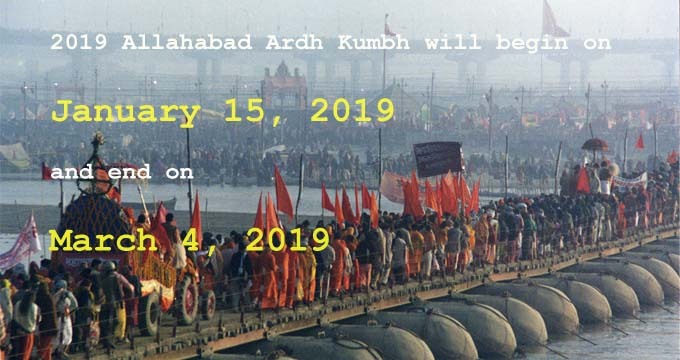 This section contains information on Ardh Kumbh Mela dates to be held in Allahabad in 2019 and in future. Kumbh Mela, the grandest of all gatherings is a commingling of millions of souls that come together to purge themselves before entering the heavenly realm of God; it is an open invitation, which is grabbed on like the very last opportunity by the devotees to deem themselves fit for an entry. It is held every three years in each of the four different locations - Allahabad, Haridwar, Nasik and Ujjain, returning to each of the four places after a gap of every twelve years. Besides the regular Kumbh Mela, an Ardh (half) Kumbh Mela takes place six years after the Maha Kumbh in each of the location. And how it lands up in each location varies according to what position the Sun, Moon, and Jupiter hold in that period in different zodiac signs. It comes to Haridwar when Jupiter is in Aquarius and Sun is in Aries during the Hindu month of Chaitra i.e. in the month of March-April. In Allahabad it is celebrated in the month of January-February when Jupiter is in Aries or Taurus and Sun and Moon are in Capricorn during the Hindu month of Magha. In the Hindu month of Bhadraprada (August-September), when Sun and Jupiter are in Leo, Kumbh Mela comes to Nasik. And Ujjain gets to organize it when Jupiter is in Leo and Sun is in Aries, or when all three are in Libra during the Hindu month of Vaisakha i.e. April-May. 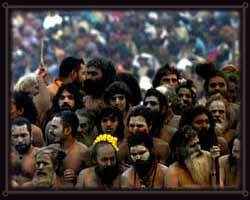 Below is a comprehensive list of Kumbh Mela dates with the names of the host cities. The Maha Kumbh Mela to be held in Ujjain in the year 2016 will commence on 22nd of April and will end on 21st of May 2016. On 11th August 2016 the Kumbh Mela will end with the flag lowering ceremony.